Silver_Foil_Lined_Envelopes is rated 4.7 out of 5 by 13. Rated 3 out of 5 by Nadine from pros/cons I placed my order on Sunday and as promised, it was ready for pick-up Monday morning. However, at least 20-25 of the envelopes were damaged and couldn't be used. Rated 5 out of 5 by AquaC from Nice Envelopes I purchased these for mailing my rather large invitations. It was pretty difficult to find the right size envelopes, JAM made it pretty simple to find them. The envelopes were sturdy and pretty, great for my wedding invitation needs. Rated 3 out of 5 by Lissal from Good holiday envelopes with one caveat I've bought these every year for many years. The batch I got this year the glue strip didn't go all the way across and was very inconsistent. Rated 5 out of 5 by Rhondella from As advertised Good quality. Very fast service. These envelopes make a lovely mailing for my homemade Christmas cards! Rated 5 out of 5 by Ozma from Great product, and outstanding service. I'm ecstatic to find Jam Paper supplies! A few years ago I ordered a large number of an absolutely lovely and expensive personalized Christmas card to send to clients, friends, and family. An unfortunate accident ruined most of the matching envelopes. I've kept the cards hoping that I might find some way to be able to still use them. I despaired of ever finding an envelope of the right size and with the same silver foil lining. But I decided to check the Internet, just in case. To my delight, I found Jam Paper's website. Even though I was apprehensive I decided I had nothing to lose. I was amazed at the selection available, at how responsive Jam Paper was to my order and how quickly I received my package. The envelopes were perfect! Thank you! I will use your website again, and recommend it to others! Rated 5 out of 5 by tnlawgirl from Classy little envelope! I got these to go with some custom invitations for my "thank you" notes for my bridal shower. The silver lining is an unexpected but neat little detail that I hope my recipients found quite special when they opened their cards. I would order from Jam again, they were fast shipping and high quality. Rated 5 out of 5 by tiggerkf from Great product! Fast shipping! These were the exact inner envelopes I needed for my wedding invitations! Very nice quality and fast shipping! Hello! The foil on this White with Silver Foil envelope has a shiny finish. Thanks for the question! Yes, you can print on the outside of this envelope. And 2. The only option we have that is blue and silver is our Stardream Lapis Lazuli with silver lining found here : https://www.jampaper.com/ecom/index.asp/show/detail/cat/52/prd/324/c/4114/s/693 It is only in an A6 size though, not sure if that's what you're looking for. Hope this helps! What is the flap size for the 6 x 6 envelope (top to bottom not side to side)? The flap size is 2 1/4 inches top to bottom. Hope this helps! Is it possible to print our return address on the flap? Will this envelop work with a laser-jet printer? Yes, it should work with laser-jet printers! Are these double envelopes for graduation announcements? I need double envelopes for a 5x7 graduation announcements. They are not double envelopes. Sorry for any inconvenience this may cause. Hi Chris. We emailed you with additional details. Please respond at your convenience. It's 24 lb. paper. The quantity is not an issue - we have as much as you want! 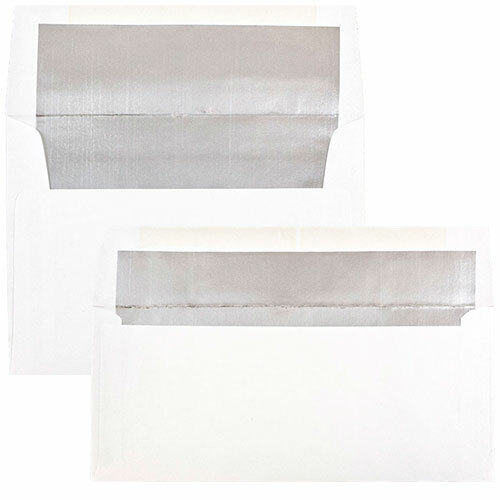 There’s always a silver lining with these Silver Foil Lined Envelopes! No longer will you be stressing about how many invitations you have to send out. You take one look at the lining and sigh with relief. Because even if they're a little late, your recipients won't be mad either! They'll take one look at the gleaming lining and forget about everything. The silver lining certainly brings a glimmering effect to the neutral envelope. From wedding invitations to formal banquets, from advertisements to flyers, these stunning envelopes will surely bring a formal and professional sense to whatever is going inside. Love the lining but want another color? Look under 'Other JAM'n Products You Might Like' to see a wide assortment!